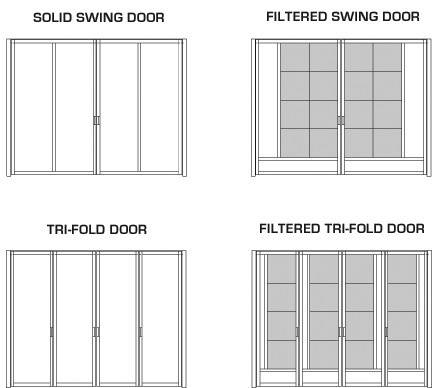 Product doors are constructed of tubular frames and sheet metal, and are factory painted. Filters, door handles, door safety latches and foam tape are included. Solid doors are used with pressurized input plenums to enclose open front paint booths in pressurized applications. The door size is 2 feet shorter than the booth’s interior height and 4 feet narrower than the booth’s interior width. Filter doors allow product entry and exit in non-pressurized booths, while filtering input air. The doors attach directly to the front of the booth, adding minimal depth to the booth. 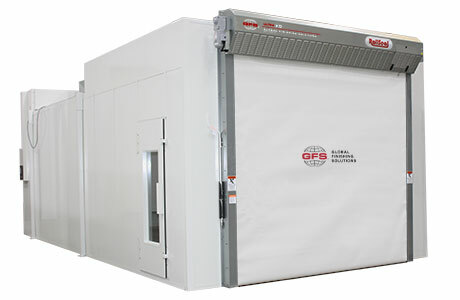 Roll-up doors are manufactured per GFS’ specifications. The finished product is delivered directly to the job site by the manufacturer — to be installed, adjusted and serviced by trained factory personnel. 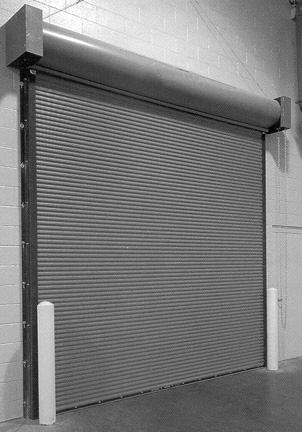 Roll-up doors are available in galvanized stainless steel and aluminum. Finishes range from 21 standard colors to 172 premium colors, or color-matched to customer specifications, as well as colored, anodized aluminum. Exclusive to GFS paint booths and finishing equipment, RollSeal Automated Doors eliminate the space needed for traditional swing or wing-style doors. RollSeal Doors are durable and low maintenance, providing an excellent seal at an affordable price. 3-by-7-foot universal personnel access doors are constructed of 18-gauge galvanized sheet steel. The door can be located on either side of the booth and can be installed for a right- or left-hand swing to meet user requirements. Options include an 18-by-24-inch observation window and pre-coated white. Includes an installation kit. Observation windows are designed for applications with booth panels and for use with solid product doors. Featuring clear, tempered glass, observation windows are an attractive option for monitoring personnel safety, with a safe, unobstructed view of painting operations. Panel Kit includes tempered glass and weather stripping. Want to learn more about paint booth doors? 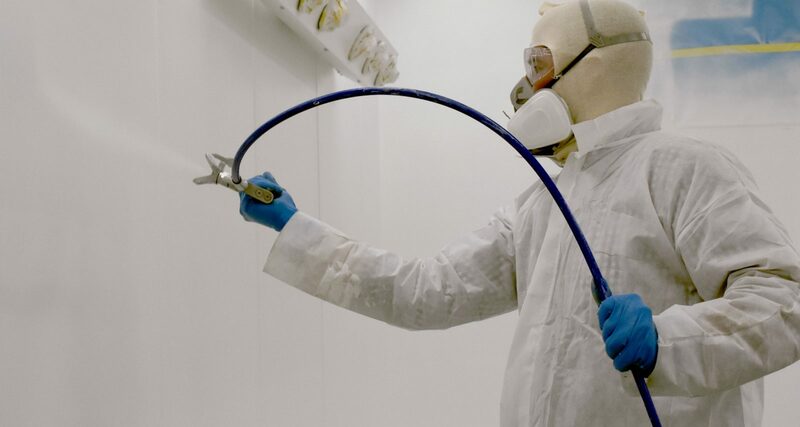 Booth Shield from Global Finishing Solutions (GFS) creates a safer spraying environment by trapping the overspray that collects on booth walls. With Booth Shield, you can save valuable time, avoid unnecessary hassle and achieve better-quality paint finishes. 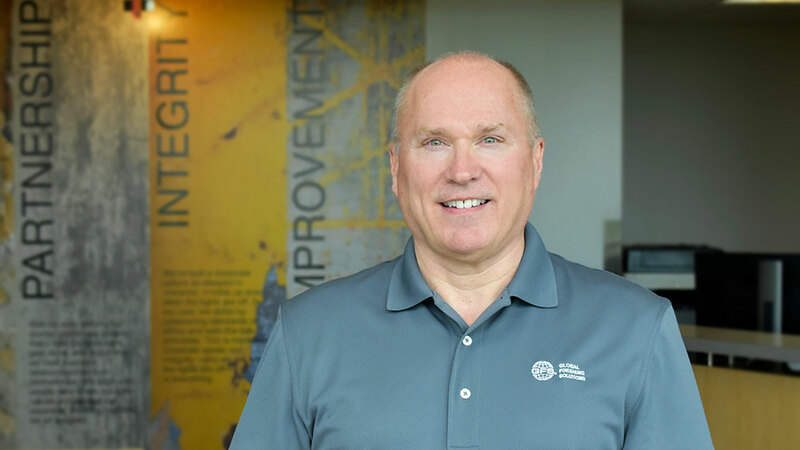 Effective June 5, 2018, Global Finishing Solutions (GFS) is excited to announce the development of a new business unit that will better align departments to support the growing needs of GFS’ customers for aftermarket service and support of their equipment. 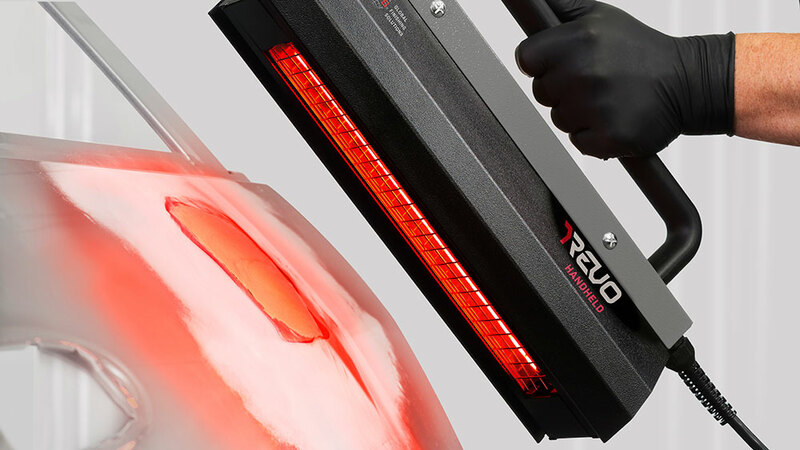 Whether you want to protect your paint booth’s walls, lights, windows or floor, the Booth Shield line from Global Finishing Solutions (GFS) has the right product for you. Booth Shield provides superior protection and creates a safer spraying environment. The coatings can be applied quickly and removed easily, without damaging the underlying substrate.